This will be the star of the party, the stand-out dessert. 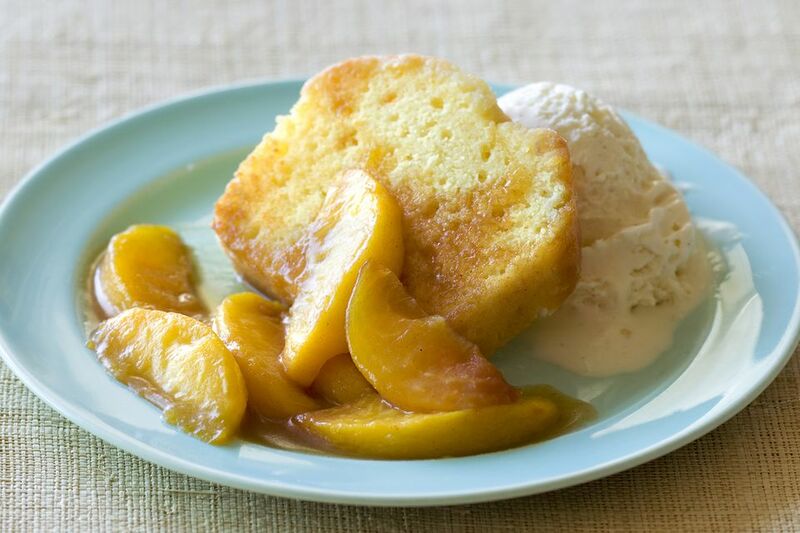 Serve this luscious peach pound cake with whipped cream, or dust with sifted powdered sugar. It's moist enough to go without a glaze or frosting, but a peach sauce would be great with the sliced cake. We received several positive comments about this cake. One person suggested a simple glaze of warm peach preserves and whipped topping, and another person boiled the syrup with a little extra sugar and butter to make a glaze for the cake. Heat oven to 325 F. Butter and flour a 12-cup Bundt cake pan, or spray with a baking spray. Drain syrup from peaches; measure 1/3 cup of the syrup and reserve. Chop peaches finely and set aside. Beat butter and sugar until light and fluffy. Add the eggs one at a time, beating after each addition. Beat in vanilla. In another bowl, combine flour, baking powder, salt, and soda. Blend dry mixture into the creamed mixture, alternating with buttermilk; fold in reserved 1/3 cup of peach syrup and the chopped peaches. Spoon into prepared baking pan. Bake for 1 hour to 1 hour and 15 minutes, or until a toothpick or cake tester comes out clean when inserted in center. Cool in pan on a rack for 15 minutes. Invert the cake onto the rack to cool completely. Put the baking pan over the cooled cake (matching the grooves and pattern) and flip with the rack then put a serving plate over the cake and invert again.